ST. GEORGE — A candlelight vigil is being held Tuesday to honor Brad Stapley, a well known St. George pharmacist who died last week in an avalanche in central Utah. The vigil will be held at 7:30-8:30 p.m. Tuesday at the corner of Mall Drive and Riverside Drive near the location of the Stapley Pharmacy at Dino Crossing. “The Stapley Pharmacy staff would like to invite you to a candlelight tribute to honor this great man and his family,” vigil organizers said in a text message to spread word of the event. The general location of the vigil is also where a Dixie State University bison statue sponsored by Stapley Pharmacy sits. The statue, which has a depiction of the American flag draped over it, had extra meaning in the colors for Brad, his father Evan Stapley said. In the wake of Brad Stapley’s death, many who knew him have offered their sympathies, memories and support to his family. 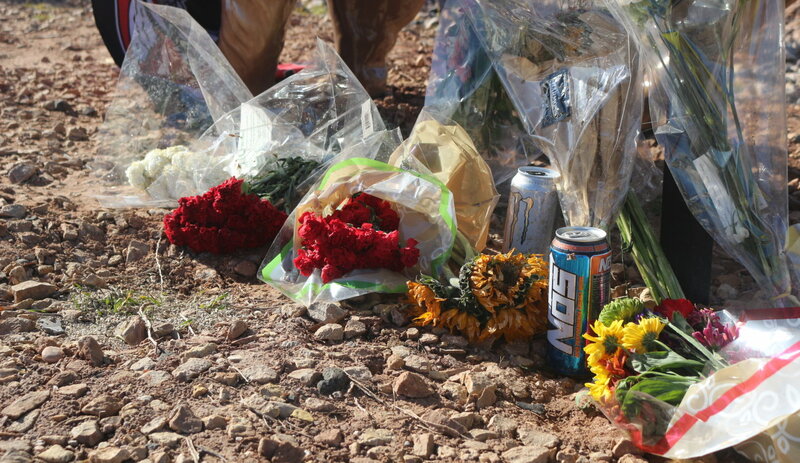 As of Monday afternoon, a University of Utah banner had been hung around the bison’s neck and multiple bouquets of flowers as well as cans of energy drinks had been left by the statue. A Facebook page called “Memories of Brad Stapley,” has been set up for people who knew Stapley to share their thoughts and memories of him. Stapley has been described as a man who made friends easily, was fun to be around and loved his friends and family. He also helped others and cared deeply for those who frequented Stapley Pharmacy. “Thank you for your love and support following the tragic loss of our friend and leader Brad Stapley,” event organizers said. Stapley and two others were snowmobiling on Circleville Mountain in Piute County Thursday when an avalanche occurred around 5 p.m. The other two men survived; authorities found Stapley’s body the following day. Organizers of the vigil are asking attendees to bring their own candles because they don’t know how many people may show up. They also suggest that attendees park on the street, at the nearby Smith’s Marketplace or at the Fossil Ridge Intermediate School and carpool if possible. What: Candlelight vigil for Brad Stapley. When: 7:30-8:30 p.m. Tuesday, Feb. 12. Where: The corner of Mall Drive and Riverside Drive in the parking lot of the Center at Dinosaur Crossing.